This little turtle snuck up into our yard the other day. Lilo had a fit barking, sniffing it, nudging it with her nose. But then when it would come out of it's shell a bit, she'd run away wimpering. Ha! 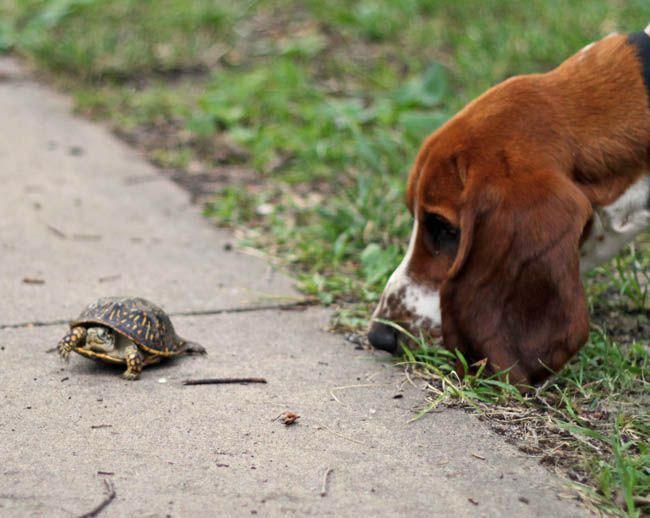 It was so funny to watch her be so confused about a little turtle. I love love love the photo. Turtles are awesome, and I love that you got it just poking out...and freaking out Lilo!!! What a great photo! I love the inquisitive but cautious look on Lilo's face. What a great shot! I like your doggy. She is so cute! I just wanted to tell you that I love that your Inner Circle example on your jewelry website is the names of my babies. :) Still my favorite piece of jewelry. Ever. i know that was cheesy. i apologize. it's late and i was at a family reunion watching my grandma get drunk off wine. ha! that is so cool that you have turtles wandering into your back yard!!! over here the only place we see them is in pet stores! yeah!! finally a picture of lilo! she is adorable with that turtle! any sign of stitch yet? fun picture. Just curious if Stitch has returned? This is so funny because both of my dogs do the same thing with the frogs that show up on our porch every night. My dachshund Sally has learned that they show up around 8:30 and she begs to go out every night. Then Sally and our boxer Lucy take turns sniffing, pouncing, and pawing at the frogs. Then when the frogs start hopping, both dogs run away! Oh my goodness, I love this picture. Hound dogs are the best.